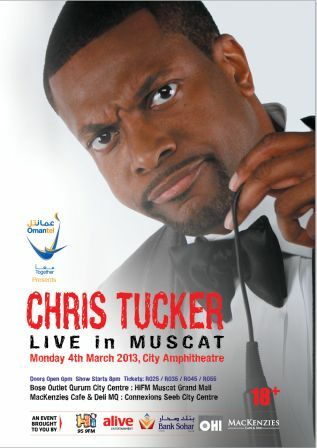 As you may be aware by now, Chris Tucker is coming to Muscat for 1 night only on the 4th March at the City Amphitheatre, brought by Hi FM and Alive Entertainment. Tickets are going on sale this Monday - I expect them to go pretty quickly! And I have a pair of tickets to give away to this awesome gig (thanks Daz & Gordon) - I can't wait to see him perform, it's going to be great. As always, it's really simple to get your name into the draw to see if I will pull your number out of my near-famous al fair bag full of numbers. Either send me an email with the following subject line: "I want Chris Tucker tix" to my usual email address (mrsythe[at]gmail[dot]com) or leave a comment here - if you leave a comment here, please be sure to leave an email address for me to contact you should you be the winner! I want Chris Tucker Tix! My husband would be very happy if I won lol. I want Christ Tucker tix. "I want Chris Tucker tix"
I'm a sucker for chris tucker! "I want Chris Tucker tickets pls"